All 3D printing processes build parts layer-by-layer. Due to the additive nature of 3D Printing, the thickness of each layer determines the resolution of a print in a similar way that the number of pixels determines the resolution of a television or computer monitor. Lower layer height typically results in parts with smoother surfaces. The downside is that the lower the layer height the longer it takes to complete a print. It is important for a designer to determine whether aesthetics (a smoother surface) or time (and cost) savings are more important. 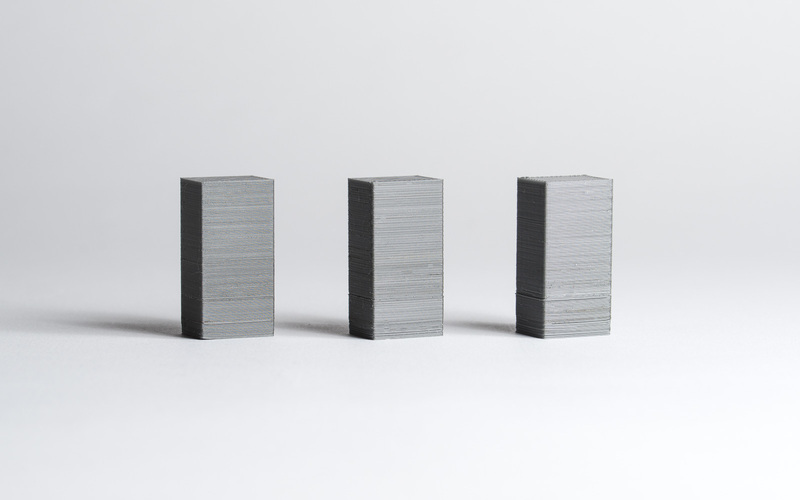 In this article, we discuss the benefits and limitations of using different layer heights in 3D Printing. 3 FDM parts printed at 50, 200 and 300 microns (left to right). 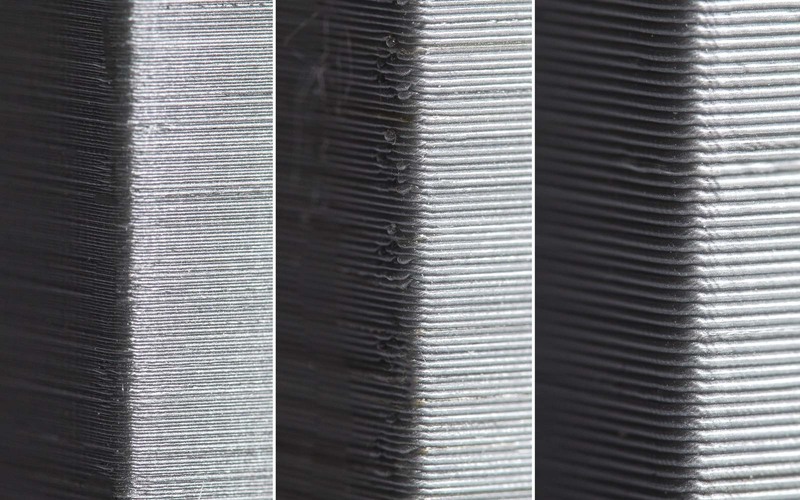 A macro view of the FDM prints (50, 200 and 300 microns from left to right) shown at the same scale for comparison. Why is layer height important? For some printing processes (such as SLS, Material Jetting or SLM/DMLS) selecting a layer height is not very important, as their default resolution is already adequate for most applications or the layer height is already pre-set by the machice manufacturer. For other processes (such as FDM and SLA) layer height is an important design parameter that impacts the printing time, cost, visual appearance and physical properties of a printed part. Often the visual difference between parts printed at 100 μm and 200 μm is very small. However, the part at 100 μm will take twice as long to print (the 3D printer will have to trace twice as many cross sections) and this will have an impact on the cost. What is the typical layer height for each process? When to choose a lower layer height? Part geometry: Does your 3D model have curved surfaces or holes? Use case & application: Is functionality or visual appearance the main design consideration? Post processing: Will the part be finished after 3D printing and before use? The impact of layer height is more noticeable on curves and angles and is less prominent on straight vertical walls, due to the layer-by-layer nature of 3D printing. For example, in order to print a hole along a horizontal axis, the printer software has to slice the circular hole into multiple layers and then stack them on top of each other, creating a non-smooth edge that looks like a staircase. This is called the stepping effect and becomes more prominent at surfaces with greater curvature. If a design includes a significant number of curves, angles or hole using a lower layer height will result in a more accurate part. The stepping effect becomes more prevalent in areas of larger curvature. Layer height will have an impact on the vertical resolution of the part, affecting its smoothness. If visual appearance is the main concern, then selecting a lower layer height is ideal, as it will result in a smoother finish. On the other hand, when 3D printing a functional part, using a higher layer height is preferred, as it will result in time and cost savings and improved mechanical performance. For example, FDM parts printed in PLA at a 300 μm layer height have approximately 20% higher strength than parts printed at 100 μm. When deciding on a layer height it is also important to consider whether the parts will be post-processed. A higher layer height may be a better choice, if the part is going to be sanded, acetone smoothed or painted. For an overview of the available post processing methods for FDM, SLS and SLA parts, see later article of the Knowledge Base. Select a lower layer height for parts with curved surfaces or when visual appearance is important. Higher layer height is faster and more cost-effective and will result in parts with improved mechanical properties. If the parts will be post processed, layer height is not as important.